Start off your visit on the 26th (Fri): explore the wealth of natural beauty at Pyha-Luosto National Park. For maps, reviews, where to stay, and more tourist information, read our Luosto online road trip planner . Edinburgh, UK to Luosto is an approximately 10.5-hour flight. You can also drive. The time zone changes from Greenwich Mean Time (GMT) to Eastern European Time (EET), which is usually a 2 hour difference. Prepare for a bit cooler weather when traveling from Edinburgh in October: high temperatures in Luosto hover around 3°C and lows are around -2°C. Finish up your sightseeing early on the 26th (Fri) so you can go by car to Levi. 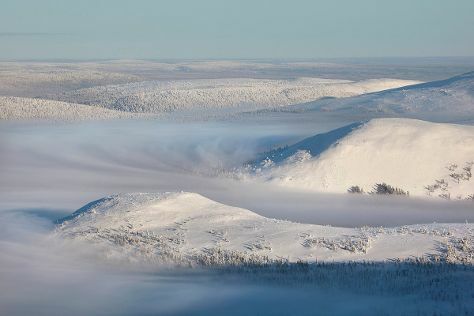 Start off your visit on the 27th (Sat): stop by Elan Ski Shop & Rental and then explore the wealth of natural beauty at Pallas-Yllastunturi National Park. Keep things going the next day: ski along the peaceful trails at Levi Ski Resort. For ratings and more tourist information, you can read our Levi online trip itinerary maker . You can drive from Luosto to Levi in 2.5 hours. Alternatively, you can take a bus. October in Levi sees daily highs of 3°C and lows of -3°C at night. Finish your sightseeing early on the 28th (Sun) so you can drive to Rovaniemi. On the 29th (Mon), stop by Your Piece Of Finland, get engrossed in the history at Arktikum, pause for some serene contemplation at Rovaniemi Church, then see Santa Claus Office, and finally get in on the family fun at Santa Claus Village. Get ready for a full day of sightseeing on the 30th (Tue): explore and take pictures at Lappi Areena, then see exotic creatures in open habitats at a safari tour, and then make a trip to Lordi's Square. For maps, traveler tips, other places to visit, and tourist information, read our Rovaniemi trip maker website . Traveling by car from Levi to Rovaniemi takes 2.5 hours. Alternatively, you can take a bus. In October in Rovaniemi, expect temperatures between 3°C during the day and -1°C at night. Finish your sightseeing early on the 30th (Tue) to allow enough time to travel back home.